For macbooks, the best one we have shared is Macbook battery monitor from SonoraGraphics! 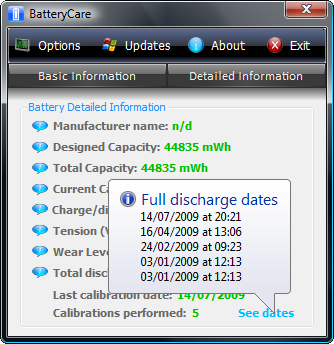 But for Windows there are many battery monitors and stats displaying tools which work on pretty different basis, and one of them is BatteryCare. The BatteryCare battery monitoring program helps in showing up the stats of battery usage of a laptop, in every possible way so that the performance can be judged and improved. Battery’s discharge cycles monitoring – It records everytime when the battery charge is finished, and a complete discharge has happened. Counted as a cycle. When a number of cycles are reached, then you are notified to finish a full discharge. Notification section – To notify you and display how much battery percentage is left when not charging, and the time estimated depending on your usage. Complete battery information – Many many things are shown in this. Like the wear levels, capacities, consumption, and also it identifies the battery manufacturer. Its just more than what the laptop comes with for the battery info display. Optimizes theme settings to save battery – The graphics-filled themes in Windows Vista which might be affecting and eating-up the battery like, are automatically optimized and disabled, when you are not running on power and just on laptop battery. Everything gets back to normal when you are connected to power supply again. Automatic power plans switching – Depending on the power source of the computer, BatteryCare can automatically select the power plan you prefer. Just install once, it will auto-update – You don’t have to worry about any new updates of the software as it updates automatically. Other data – On the mouse hover-over in taskbar shows the CPU temperature, and the discharge rate of the power supply. Shows the full discharge dates and count of discharge and calibrations. SuperFetch, ReadyBoost and SearchIndexer – These 3 services are seen in Windows Vista and higher, and they eat most of the battery life when not connected to power. So these services too are discontinued once you start using the laptop through battery. And stopping them does not change anything in the performance of the laptop. They are restored back normally and work again when power connection resumes. 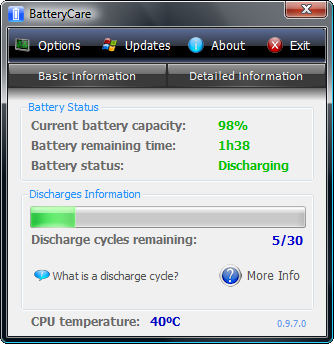 BatteryCare is Compatible with Microsoft Windows XP and Windows Vista. It requires Microsoft .NET Framework Version 2.0. A good monitor program. Lets me know when to give my laptop some rest, when it gets heated to a high temperature. The discharge cycles, the battery life and the capacity too are displayed. One more feature I liked about it is that the program helps you optimize the theme settings in Windows, making the battery life better. The tutorial was really good and the can you let me know is there any application for windows. Oh thats good but will it give the whole information about the battery that is been used and how much cycles has been used.